Coventry City chief executive presented more details about the future stadium for his side, much smaller than the Ricoh Arena. Meanwhile Ricoh Arena operator threatens to sue Northampton United, should they agree to groundshare with City. Just as a reminder, Coventry City recently signed an agreement to hold home games in Northampton for the next three, maybe even 5 seasons. However, as Sixfields Stadium is roughly 37 miles (60 km) away from Coventry, opposition among supporters is very high. The fans already staged two demonstrations and gather support for their protest from other fan associations, most notably Supporters Direct and Football Supporters Europe. 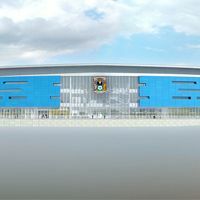 to ease the pressure chief executive Tim Fisher announced several new developments on the idea of a new stadium, privately owned by Coventry City. The ground is to be located ‘in the Coventry area’ and the club are closing in on negotiations over two plots. "It will be in the Coventry area, we've got a number of sites both in the north and all around the Coventry boundary. They are very, very close. "Ideally I'd like to get exclusivity on two, simply because it gives you the right to exclusive negotiation to close them and, frankly, you don't go into the final furlong of a horse race (with one), you want to get two lined up. The new stadium is thought to be based on New York Stadium in Rotherham, opened in 2012. The model is Rotherham's New York Stadium, it's a great stadium. It's modular so it grows as the club grows. Could this quick attempt by StadiumDB.com be a view of the future, then? "Attendance? Around 18,000, and I will argue that 18,000 is enough. Then if things go well over time, it grows. "Also, all around the bottom of the site, we want to add a scheme and that is going to be where the real value is in this because there will be a mix of commercial, residential - again, depending on the final site we go with. While Coventry City give details of their plans, the previous ground is still eager to see them return. Arena Coventry Limited has issued a letter to Northampton Town, threatening to legally challenge the groundshare deal between the home club of Sixfields and City. The Ricoh operator claims his contract with City from 2006 still stands and thus any deal with Northampton would be help in breaking the deal, enabling ACL to demand compensation. A brief club statement on Northampton's official website read: "Northampton Town Football Club confirms that Arena Coventry Limited (ACL) has threatened the club with legal action in respect of Coventry City FC playing at Sixfields Stadium. "The club was approached by Coventry City to play at Sixfields, so that Coventry City could fulfill its fixtures. The Football League has endorsed this arrangement.